That being said, in the interests of security, sometime ago I started using a downstream SMTP service which requires user credentials, (that way no one could use the downstream server anonymously). As an additional security step, I use an account which requires that the credentials are changed every 30 days or so. This is always a good security practice for a myriad of obvious reasons, but this meant that I needed to update the SMTP username/password settings in my IIS configuration settings every 30 days. Jumping ahead a couple of years, I decided to rewrite the script as an HTML Application, which offered me considerably more options from a user interface perspective. That script has been serving me faithfully for some time now, so I thought that it would make a good blog subject. The script will read any existing credentials from your IIS settings and use those to pre-populate the interface. If no existing credentials are found, it will pre-populate the interface with the username of the currently-logged-on user. Clicking Update will update your IIS settings, clicking Reset will reset the values back to the last saved version, and clicking Close will obviously close the application, but only after it has checked if you have any unsaved changes. To create this HTML Application, save the following HTMLA code as "Reset SMTP Password.hta" to your computer, and then double-click its icon to run the application.
' Define the global variables.
' Initialization method for the application.
' Define the local variables.
' Set up the UI dimensions.
' Specify the window position and size.
' Set up some base objects for the local computer and default SMTP instance.
' Note that these settings can be customized for a different computer or SMTP instance.
' 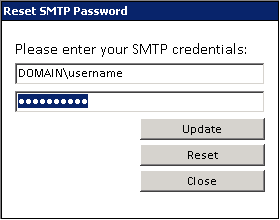 Retrieve the current username/password from the SMTP settings.
' Verify that a username was retrieved; otherwise, use the logged-on user.
' Store the username/password values in the UI.
' Implement the missing IIf() function.
' Click handler for the Close button.
' Test if we need to cancel bubbling of events.
' Check if there are pending updates.
' If not, then close the application.
' Prompt the user to exit.
' Specify whether to bubble events.
' Change handler for text boxes.
' Flag the application as having updates pending.
' Focus handler for text boxes.
' Select the text in the textbox.
' Click handler for the Reset button.
' Reset the username/password values in the UI.
' Click handler for the Update button.
' Inform the user that they made a mistake.
' Store the username/password values for the SMTP server.
' Save the username/password values.
' Flag the application as having no updates pending. That's all that there is to it, although you might want to restart your SMTP service after you have made these changes. 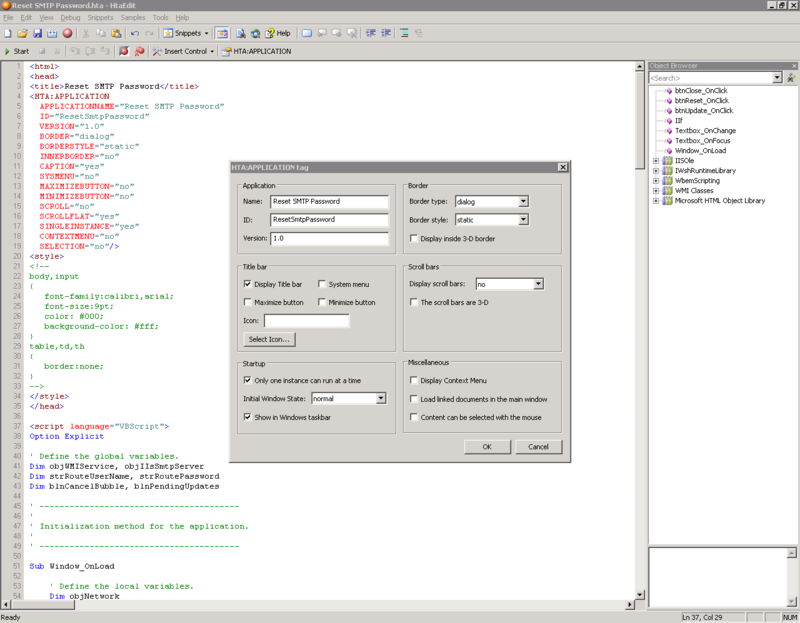 On a related topic, I get asked from time to time why I like to use HTML Applications (HTMLA) for some of my scripting examples, and the answer is quite simple: it is very easy to create powerful scripts in a very short amount of time which have sophisticated user interfaces and no compilation requirements. I use Adersoft's HtaEdit as my IDE for HTMLA, which allows me to do normal development tasks like configuring project options, setting breakpoints, and stepping through my code. Note: Click the image above to open it full-size in a separate window. That being said, I have been experimenting with creating user interfaces in PowerShell, and it looks like it has some real promise for creating great UIs, too. But for now I only use PowerShell to create command line scripts, I use HTMLA to create cool UIs for administrative scripts, and I use C# to create "real" applications.